cpd2009 Wrote: Two times in the past few days, I've been having issues posting here in the Spam Thread. Earlier this week, I tried to post a reply while on the community college WiFi network, and I couldn't post because my IP address has been apparently blacklisted. I was trying to post from Greta. Must be due to the fact that the network you were on was flagged by Cloudflare or something. Did the address start with 37.113.x.x? huckleberrypie Wrote: Must be due to the fact that the network you were on was flagged by Cloudflare or something. Did the address start with 37.113.x.x? I posted the test post above from Greta, and the post was successful. We did have a minor power outage earlier today so she must have got a non-blacklisted IP when the internet connection came back on. For now it'll probably be best to use a proxy (which can be slow) or notify the network admins that their system might be compromised or something. 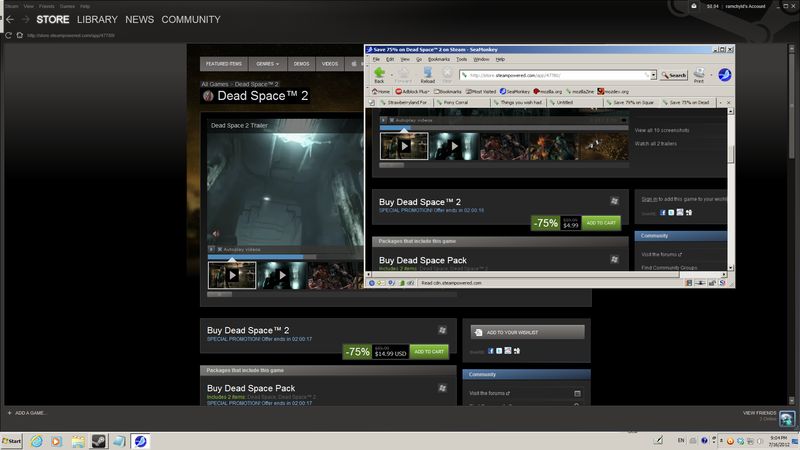 Anyways, Sandy, in your opinion, is Dead Space 2 worth 47106 rupiah (US$4.99)? Because I don't really like what I saw in the trailer presented in Steam, but it's darn cheap for another 2 hours before they return the normal price of US$20. WTF VALVE... You charging me an extra US$10 just because I'm Malaysian?!? That's BLATANT RACISM! On the other hand, Hitman Collection discounted price for Malaysia is still the same as the US... US$2.49 for a game, US$6.24 for all 3 games. Might consider that instead. Maybe it's EA that is racist. Squeenix would be much more generous because 1. Most of their money comes from Final Fantasy and not Hitman, and 2. They're also an Asian company. That's an arse. And yeah, you can get away with trying to get rid of imbeciles in the Hitman games. Well, do you like survival horror with all the gore? I must remind you that if you're paranoid and get easily panicked you'll get nightmares for the rest of your life because of this game. Alright, I'm exaggerating about that, but like in many other survival horror games, in one second the situation seems clear but then in an instant a monster can jump on you and if you don't react quickly all your limbs will be torn off. I bought the game for less than half the price (You know, Indonesia), and it was actually more than worth the price for me. Just make sure that you're ready for all the cat scare, jump scare, and gores you'll see. Blackberry Bun Wrote: Well, do you like survival horror with all the gore? I must remind you that if you're paranoid and get easily panicked you'll get nightmares for the rest of your life because of this game. Alright, I'm exaggerating about that, but like in many other survival horror games, in one second the situation seems clear but then in an instant a monster can jump on you and if you don't react quickly all your limbs will be torn off. huckleberrypie Wrote: That's an arse. And yeah, you can get away with trying to get rid of imbeciles in the Hitman games. We're right next to Lake Ontario, and yes, we're done with this moving around.